The Foreign Secretary used a visit to Glasgow to make clear the Prime Minister would rebuff any request from Nicola Sturgeon to hold a second legally binding ballot on the issue. It came as the SNP’s depute leader Keith Brown insisted such a move “should not prevent” a fresh vote on breaking up the UK from taking place - although the First Minister later appeared to rule this out as an option. Mr Brown hit out at the “deeply undemocratic” stance of the Tories at Westminster on the issue, as he argued the Scottish Government already had a mandate to call a second independence referendum. Those comments prompted Scottish Tory interim leader Jackson Carlaw to raise fears the SNP could “launch an illegal referendum within a matter of weeks”. While the Scottish Government could stage another vote, a section 30 order transferring the powers needed to hold such a ballot from Westminster would be needed for it to be legally binding. The SNP say the 2016 Holyrood manifesto gives them the right to hold another vote. Ms Sturgeon’s party won that election, with the manifesto including a commitment that another referendum could be held if there was a significant change in circumstances from 2014 - such as Scotland being taken out of the European Union against the wishes of voters north of the border. The Foreign Secretary was asked during a visit to Glasgow University what Mrs May’s response should be “yes or no” if the First Minister does ask permission to hold another referendum. The Foreign Secretary said: “The answer of course would be no for the very simple reason that we think the Scottish Government should be focusing on the concerns of Scottish voters, which is not to have another very divisive independence referendum but to focus on an education system which used to be the envy of the world and standards are now falling, to focus on long waits in the NHS. 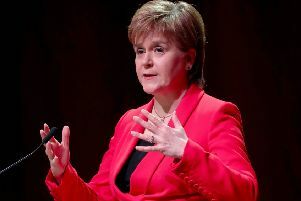 Ms Sturgeon said that the legal basis for any future referendum should be “the same” as for the 2014 - where the Edinburgh agreement struck between the Scottish and UK gvoernment set out the conditions for a legally binding ballot.